New DLC for Mass Effect 2 is coming next month that will set players off on a multi-level battle against a rogue AI. Mass Effect 2 Executive Producer Casey Hudson told Gamerzines that the new DLC, titled Overlord, will include "five levels set across one story on one planet." Players will go head-to-head with the forces of an AI that's taken over a laboratory and is presumably set on perpetrating one sort of villainy or another on the rest of the world. It hardly seems like something worth the attention of a team that's just saved the entire galaxy from the most dangerous threat ever, but I suppose they have to fill their days somehow. No new characters will be added by Overlord, Hudson said, or by any future DLC for that matter, making Kasumi Goto the final member of the crew. On the upside, the new content won't be entirely linear; between levels, players will be able to use the Hammerhead hovertank to explore the planet. No pricing or specific release date has been set, although for the record, I'll happily pay pretty much whatever EA wants if the AI calls Shepard "a pathetic creature of meat and bone" at least once. We'll update with the details when an official announcement is made. UPDATE: It's not dated yet, but then again BioWare DLC and reliable launch dates hardly go hand-in-hand anyway. 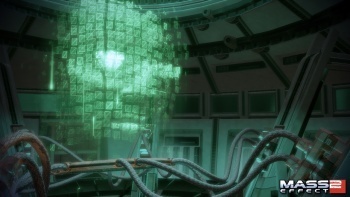 We do have a few more details, however: A Cerberus experiment with a human/VI hybrid has spun out of control, the Geth have somehow become involved and now the murderous machine mind is looking for a way off the planet. Only Commander Shepard and his team can save humanity from the homicidal intergalactic shenanigans that threaten to ensue! Pricing for the Overlord DLC has been set at 560 Microsoft points for the Xbox 360 or 560 BioWare points for the PC. Read all about it at bioware.com.